This is another high quality reproduction of knitting books by Mrs. Mee and Miss Austin. 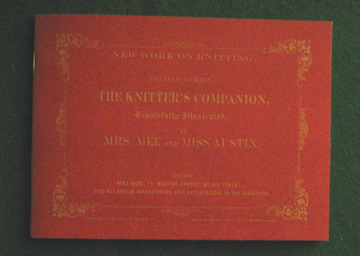 Like the other Knitter's Companion, it has no copyright date but does contain an ad that references 1862. The only element which is missing is that the cover states that the booklet is "beautifully illustrated" and this copy doesn't have any illustrations. We did not contact the publisher but we expect the illustrations were not in the original she was able to copy. Also like the other knitting booklet, this, too, is a collection of knitting projects. The booklet contains 23 projects. They are as small as a baby's shoe or a knitted necktie (only an ounce of yarn in this later project) on up to much larger ones. The larger projects include such items as a quilt, a carriage wrapper, and a bassinette cover, each requiring between 2 and 3 pounds of yarn.